Los Angeles, the City of Angels, surely lived up to its name this week. Harry Brown, 53-years-old, a Marine veteran, travelled from Eugene, Oregon to Long Beach, California, with his eight-month-old service dog, Olivia, on a trip to make amends for things from his past. His plan in California was to visit his grandchildren, whom he had not seen in nine years. Mr. Brown has been homeless for a few years, but takes excellent care of his best friend, Olivia Ann Stinkpot, a mixed breed who has been with him since she was five weeks old. She is still in training to assist him with his PTSD. Mr. Brown is also living with pancreatic cancer, and wanted to visit his remaining relatives across the country, before the disease claimed his life. Twenty-five years of alcohol abuse have so damaged his liver that therapy or treatments are not possible. He has been sober for the past seven years, and he saw this trip as his last chance to make amends, visiting his remaining family who are spread out across the country. He was in Long Beach with Olivia last week, enjoying the warm sand and the sound of the ocean, which he had promised Olivia he would show to her. Harry says that, while relaxing, he fell asleep, dropping Olivia's leash. As young dogs will do, Olivia wandered off. When Harry awoke, he was frantic with worry, and began searching for her. Harry does not have a vehicle. Originally from Pennsylvania, he had travelled from Oregon to California with help of a rideshare he found on Craigslist. His intention was to spend just one day in California, and then travel to Phoenix, Arizona, to continue visiting other relatives, but his search for Olivia sent him five days beyond his original plan. Not knowing there was an animal shelter in Long Beach, he walked the 16 miles from Long Beach to Los Angeles, searching for Olivia, hoping he'd find her when he arrived at the L.A. animal shelter. But it was not to be. There was no sign of his girl. Harry was devastated, knowing he had to leave town with his rideshare, to continue his journey towards Phoenix. He postedthis ad on Craigslist, hoping that someone would contact him. He told Examiner, he would return to L.A. immediately, if someone found her and contacted him, "even if he had to hitchhike to get there." His Craigslist ad reads, "Her name is Olivia and she is the life to me...Please help even if you see her just running by. She had a pink service vest, new leash with pick color (sic) very distinctive brindle markings. I would offer reward but I am a disabled veteran have nothing but that little girl. So please, if you can help unite us, I would be forever in your debt." He didn't hear back from anyone and Harry thought Olivia was lost to him forever, travelling to Phoenix completely broken-hearted. Olivia had no ID, and had not been microchipped. He even gave away her toys, bowls and bedding, thinking he'd never see her again. He kept hoping that she had been found by someone who would take care of his little girl. And then he got an email that changed his life. The email said his dog was in L.A. County, go get her. So Harry prepared to make a return trip from Phoenix to Los Angeles. This is when word of his plight came to the people at Captain Care, a non-profit animal rescue group. People started donating to help reunite Harry with Olivia. Captain Care volunteers went above and beyond to make it happen. They donated money for a bus ticket, which would get him from Phoenix to Los Angeles. Another volunteer, a woman named Sheryl, who was a fellow veteran in the Naval branch, drove to the bus station at 2 A.M. to pick him up. Donors had gotten him a room at a hotel for the evening. They surprised him there with new toys, treats and food for his girl. They even gave him a hammock to sleep in, for him to use while he's on the road. Harry tells Examiner that Southern California Honda will arrange to give him a bus ticket to wherever his journey takes him next. He has a great many stops to reach, before his journey ends. Harry was overwhelmed that so many strangers were reaching out to help him. His Facebook reveals much of his heart. 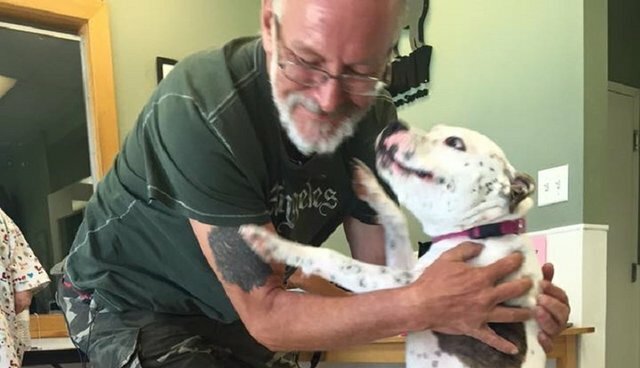 After he got the email telling him that Olivia had been found, Harry says, "My heart mended its self in seconds and felt like it was ready to explode....From the kind words and emotional support to the logistics of getting me here and springing Olivia from the pound, THANK YOU ALL!!!" While Harry was making his trip to Phoenix, this is what happened to Olivia. Ten days ago, Olivia had been found by some kids, wandering down the road in Long Beach, and brought him to Animal Control. That's when the stars began to align for Harry and Olivia. A woman named Helen Trimble, who has an amazing knack for reuniting lost pets with their owners, using this Facebook site called Lost and Found Paws in Los Angeles Metro Area, did some searching. She saw the lost dog listing, and began hunting through posts from local shelters, when she spied one that looked like a very sad Olivia. She contacted Harry and began working on a way to reunite the two. She reached out to Phyllis Kuehn, from Captain Care, asking for assistance to make it happen. After he arrived at his hotel Tuesday, Harry got almost no sleep, he was so anxious, waiting for the doors of the shelter to open. This morning, the two were reunited, with many tears shed by everyone involved. He even visited Auntie Lucy's Pet Feed Store, where he received more gifts, including shampoo and flea treatment. Through text messages supplied exclusively to this Examiner by Ms. Trimble, Harry writes, "Helen, I can't stop crying (tears of joy). I honestly didn't think I would ever see her again." Helen tells Examiner that she was touched by Harry, that he is extremely honest and humble. "Harry never asked for anything, except help in finding his dog, and information on how he could get her out with payment plans." She asked Harry if he ever thought there was so much love in the world, and he told her, "No, I was losing faith in society and even myself. This whole experience has strengthened me." Other than help with Olivia, the only thing Harry wanted was a new sunhat, which he lost while searching for his dog. Thanks to her benefactors, Olivia is now up-to-date on all her vaccines spayed and microchipped, the $400 in fees have been paid. Of Olivia, who was as overjoyed to see Harry as he was to see her, Harry says, "she gives him the drive to keep going, and make my life a little bit better. She's my life." He's also had offers from his many angels to take in Olivia, once his own time has come, but he tells Examiner, in a lovely Irish brogue, that she will be going to live with his ex-wife. She will be safe now, and forever. She will be by his side when he breathes his last. Harry knows these days of travelling with Olivia will come to an end, and wanted to express his gratitude to an amazing bunch of strangers. He says, "I plan to journal this final journey of closing doors and making amends...it's not just about me anymore. I love you all and thank you for being in my life." His journey now is to make peace with himself and those he may have hurt, see places he visited before, but now, with sober eyes. He is searching for validation in that he fulfilled his life's purpose. Novato CA 94948 A link to their web page is here, and you can find their Facebook link here. Clearly, there are still angels among us, and Captain Care is filled with angels.